Copilot the Millennium Falcon as Chewbacca with this 3/4 Chewbacca mask! The mask is made of vinyl and is textured and multi-shaded for an authentic Wookiee hairy look. Holes are cut out for the eyes and mouth for easy breathing and vision. The inside features foam padding for a comfortable fit while an elastic band keeps the mask secure. 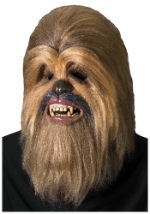 Be sure to add one of our Chewbacca costumes for a true Wookiee look this Halloween!